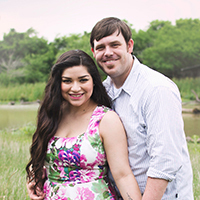 Jason and Vanessa Carlson live in South Texas with their beautiful girls, Victoria and Scarlett (with a baby on the way)! Jason is a graduate from West Texas A&M and loves serving his community as a firefighter. Vanessa is a graduate from Wayland Baptist University and teaches Science at her local middle school. Mighty Little Keeper is Jason and Vanessa’s first published book and they are excited to share their beautiful story about their daughter who was born prematurely, and ultimately triumphant. Jason and Vanessa also founded Victoria Rose’s Gift, a non-profit organization that supports families of babies in the NICU. They are positive that this story will provide hope to those who need it and that it will serve as a reminder that God can do miracles every day, but that most importantly, even when things don’t go according to plan, God is good and He never leaves our side.